As you stand in Cathedral Square in the centre of Christchurch, it is not the expected hustle and bustle of passers-by you hear but the knocking of hammer against slab and the clink and clunk of pylons and metalwork being moved around. Every four in five individuals you see are wearing the orange overalls of a builder or construction worker, individuals whose role it is to get the middle of this great city back on its feet. The thousands upon thousands of traffic cones around the city are cloaked in a similar colour. The City Tram Tours trundle by, empty. The earthquake in February, 2011- which followed on from one five months previous - was a devastating event and the aftermath is still blindingly evident. Crusaders backs coach Aaron Mauger was in the city when disaster struck. "It was a shock alright. It happened pretty fast. After September I guess we dropped our guard then February caught everyone unaware," he told ESPN. "It was devastating. It was a tough time, we lost people from the city and it took time to recover." Some parts of the city are still without running water, buildings are still being torn down in the centre while in other areas rubble is the only memory of what used to stand proudly on that plot of land. As you turn to page three of the local newspaper The Press, you find out that "there have been more than 14,000 earthquakes in Canterbury since 2010, not all able to be felt". The centre is living proof of the devastation that occurred just over four years ago. When we sat drinking coffee earlier in the square, it was not a café housed in an office building or complex, it was on the pavements at a pop-up bar in the shadow of the crumbling cathedral. Whenever a coffee was ready, with the local construction workers their main customers, the man behind the till would run a mallet along a xylophone. The upbeat sound seemed alien to the scenery around it. On the outskirts of the central business district lies Lancaster Park. On approach the taxi driver was referencing the buildings that used to stand on top of the gravel which now lies there - "there used to be an old building there, a tall one there, another there … there". It is hard to avoid a feeling of emotion when you see the once great ground standing unused and desolate. When you look through the fence at where the Hadlee Stand used to be the unkempt grass masks the former turf on which some outstanding rugby was played. 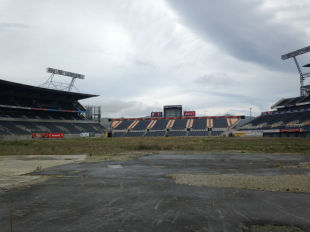 It was redeveloped in time for the 2011 World Cup but the earthquake put paid to plans for games to be held. The city was robbed of its chance to partake in the country's biggest rugby event. It is estimated the rebuilding of Christchurch will cost in the region of $25billion with liquefaction still an issue. But out of devastation comes hope. 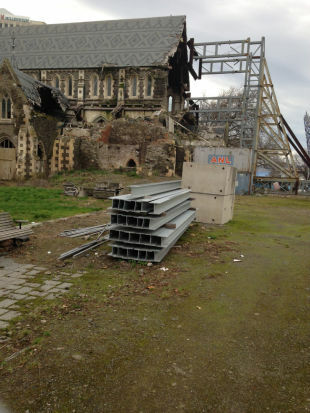 The Christchurch Central Recovery Plan has a remit of getting the centre of the city, an area that has lost in the region of 1000 buildings with more to follow, back on its feet. In the suburbs quirky boutiques, bars and cafes have sprung up now offering those inner-city delights on the outskirts. There is a great community feel. "It's not until you go through the centre and see all the empty spaces it can be saddening as you realise what was once there and the impact the earthquake had on the city but we're surviving, there's a lot of excitement about the rebuild and there's a bit of life coming back to the city and that's great," Mauger said. "It showed the spirit of the city that we got through the tough times together. " Tuesday's game will be a poignant occasion. England were meant to be here during the World Cup but the match against the Crusaders will give the locals a chance to see a Test side in action. 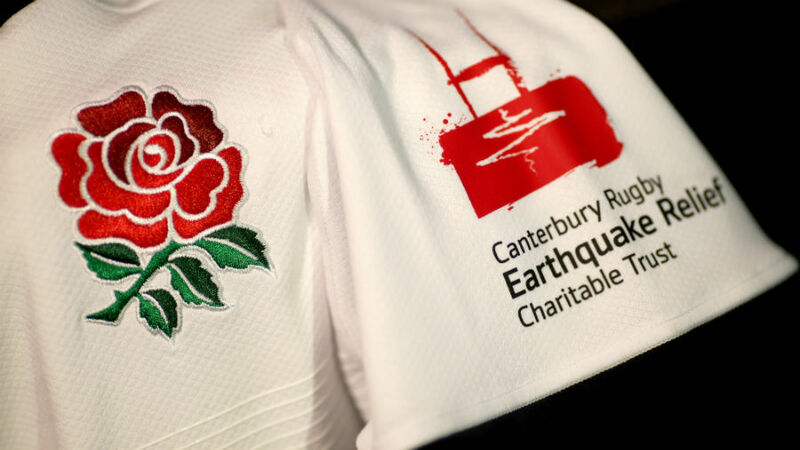 England will wear the Canterbury Rugby Earthquake Relief Charitable Trust logo on their playing shirts with 10 signed shirts to be raffled of in aid of the charity, an organisation whose aim it is to help get the area's rugby infrastructure back on its feet. "We're here to support a great cause, the great work that's been done since the earthquake and the more we can do to support it the better," Graham Rowntree said. "We're more than happy to be here, we're honoured to be here." It seems right that within England's ranks for Tuesday's game is one of Christchurch's own, Michael Paterson. He was born here, played for the Crusaders but through his grandfather, he is now a bona fide member of the England squad. "I was here 10 days before the big one in February  and obviously it's had huge impacts on the city, buildings and loss of life," Paterson said. "For the game tomorrow, hopefully it's a huge occasion for the city and the proud rugby region that it is. It'll be good to be back and have a run around". The aftermath of that fateful day back in 2011 is still there for all to see but this is a city with a unique bond between the people. The Crusaders play a huge role in Cantabrian life and they will be hoping to add another chapter to the team's illustrious history on Tuesday evening. "It's great to have an international game," Mauger said. "It's a real privilege for us to be playing an international side and a lot of the young guys are buzzing. It's a great opportunity for the fans to come along and watch England and for some of the local community to see them live, that's massive. It's a mark of respect for the Crusaders that England chose us to play and we respect the challenge and appreciate their efforts to make it happen."